The city of Harrisburg is the capital of the great state of Pennsylvania and although we are not the largest city in the state...I do consider Harrisburg to be one of the prettiest of the large cities in our state. Sure...when you think of Pennsylvania most people think of Philadelphia or Pittsburgh but those cities in my opinion are too large! Harrisburg is situated right on the banks of the beautiful Susquehanna River which feeds the Chesapeake Bay. Our beautiful city has a very active day and night light that rivals other big cities. We might not have any professional sports teams here like they do in Philly or Pittsburgh but we do have minor league baseball, soccer, basketball and hockey teams! Our city has several downtown fine dinning restaurants and an active nightlife with clubs and bars. There is always something going on downtown in Harrisburg! 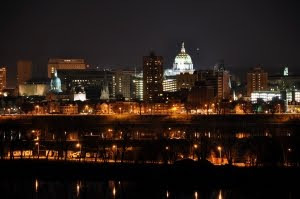 Today I thought I would share this beautiful photo (first photo) of downtown Harrisburg all lit up. In the background of the photo you will see our state capitol building all lit up in it's glory. It really is a beautiful thing to see! The second photo shows the Harrisburg Capitol Building from the other side and during the daytime hours. It's a beautiful building! If you are ever visiting Harrisburg, Pennsylvania...make sure you take a trip downtown during the night time hours so you can see all of the beautiful sites and lights that our great city has to offer.